With Christmas just around the corner the British Grooms Association (BGA) is asking employers to consider treating their staff to a gift that will last them all year long... a membership to their professional association. For just £17.50, in addition to being part of an association that supports and understands the importance of grooms to the industry, members also receive exclusive discounts on a number of things including personal accident insurance with SEIB, a £10 Derby House discount voucher and the quarterly magazine – British Grooms which is jam packed with useful tips, advice and stories. UK: Is the credit crunch affecting horse welfare? Despite the many stories in the media (see below) there is no evidence to suggest that the credit crunch is leading to large scale horse abandoment or major welfare issues in the UK. There is no doubt, as with every other industry, that most sectors of the horse industry have seen a downturn in activity. However with uncertainty about the economic future, it appears that most caring owners are looking at what they can do to reduce costs without compromising their horse's welfare. Find out about some money saving tips from Redwings Horse Sanctuary. The economic downturn is hitting Britain's paddocks. Charities say they are getting more calls than ever from owners who can no longer afford to keep their horses. The Horse Trust says it has received 640 requests to retire animals in the past month - four times the usual amount. “The Bucks Free Press is calling for readers' help to stop horses being put down because of the credit crunch. Last week we reported the Horse Trust charity in Speen had been inundated by calls from horse owners who were no longer able to afford to keep their animals. Horses are the latest victims of the economy's downward trot. The Massachusetts Society for the Prevention of Cruelty to Animals has had an influx of horses surrendered to their facility at Nevins Farm. The horses are coming from owners who can no longer afford the expensive animals, said Heather Robertson, community outreach coordinator at the facility. "They're telling us outright that they literally cannot afford to care for the animal anymore, or their home has been foreclosed on," she said. A MAN who left a horse starving in a field for up to three weeks has been jailed. Liam Taylor, 27, was already on bail for animal cruelty when an RSPCA officer found Sunshine lying in a field covered with a rug. Vets tried for three-and-a-half hours to revive the Chestnut mare, but the horse was put down on humane grounds. The RSPCA successfully prosecutes two cruelty cases in the West Midlands. A British woman, Suzanne Jenkins, who has been ordered by a court in Gloucestershire in the U.K. not to own any animals for two years after causing ‘unnecessary suffering’, is currently running a stables with 35 horses in Medina Sedonia in Cádiz. The Guardia Civil inspected the stables at Medina Sedonia in July and found horses in a dreadful state being kept in dirty facilities but without a technical report from the Junta they cannot act. A distressed rail passenger has spoken of her anger after seeing a dead horse left to rot in a field beside the train tracks. A pioneering scientific study by World Horse Welfare into the health and welfare of horses being transported across Europe prior to slaughter shows it is 'just about the worst thing you can do'. Environment Secretary Hilary Benn has launched a consultation on new codes of practices for cats, dogs and horses, that will offer practical advice on animal ownership. The codes of practice, which will be published on the Defra website and in leaflets, will help animal owners to better understand their duties under the Animal Welfare Act 2006. Launching the consultation, Hilary Benn said: "The Animal Welfare Act 2006 has been the most important piece of animal legislation for nearly a century. Animals are now afforded greater protection than ever before. These three new codes of practice will outline the responsibilities of owners under the Act and give practical advice on how to fulfil them. This means no one will be able to claim ignorance as an excuse for mistreating any animal." The main purpose of the codes is to provide practical guidance on animal owners' responsibilities under the Animal Welfare Act. If a person fails to comply with a code of practice they will not be liable to proceedings of any kind, but failure to comply with several provisions may be used in evidence to support a prosecution for animal cruelty. · Protect your animal from pain, suffering, injury and disease. Animal owners will also be able to use the codes to find external sources of information on looking after cats, dogs or horses. Since its introduction in 2007, the Animal Welfare Act has helped organisations bring successful prosecutions to people mistreating animals. Under the Animal Welfare Act, anyone convicted of cruelty to an animal could face a prison sentence or a fine up to £20,000. Consultation on the new codes starts on 4 November 2008 and ends on 31 December 2008. The Animal Welfare Act was introduced in April 2007. The Act created a duty on anyone responsible for an animal to take all reasonable steps to ensure that the needs and welfare of the animal are met. Her Majesty The Queen has made a personal donation to The British Horse Society and The Animal Health Trust's Strangles Appeal for the second year running. Her Majesty sent a cheque to the BHS, of which she has been Patron for more than 60 years, to help the charities fight the terrible disease that attacks horses. The generous gift, from the Privy Purse Charitable Trust, couldn’t be better timed, as the campaign makes a final push to reach its £250,000 target. The Queen has taken a personal interest in the ‘Breaking the Strangles hold’ campaign, a joint initiative between The British Horse Society and the Animal Health Trust, and keeps a close eye on efforts to combat the disease. Significant progress has been made this year with the introduction of a blood test to screen for the disease prior to competitions, sales or movement. The test identifies horses that have recently been exposed to the disease, enabling the number and seriousness of outbreaks to be reduced. There is still a long way to go, however, and the rest of the money is needed to help create and produce a vaccine to eradicate Strangles for good. BHS Chairman Patrick Print said: "We are very grateful to our Patron The Queen for her most generous gift, which will help fund research to find a fully effective vaccine against Strangles. I have no doubt Her Majesty's example will encourage other horse lovers to give to this worthy cause." Anyone can donate to the Strangles Appeal by posting a cheque to Strangles Appeal, Animal Health Trust, FREEPOST CB360, Lanwades Park, Kentford, Newmarket, Suffolk, CB8 7BR or phoning the AHT to make a donation by credit card or direct debit on 08700 502830. Animal health officials have identified 20 U.S. states that may have mares exposed to Contagious Equine Metritis (CEM). Virginia has quarantined two farms because of exposure to a CEM positive stallion. Click here for more information. Two more stallions, both non-Thoroughbreds, have tested positive for contagious equine metritis (CEM) in Central Kentucky, and Kentucky Agriculture Commissioner Richie Farmer has asked United Stakes Agriculture Secretary Ed Schafer to declare a state of agricultural emergency. The request is a proactive measure to ensure that sufficient resources, including federal funds, are available to manage the disease outbreak, Farmer said. Bransby Home of Rest for Horses has reopened to the public after being closed for more than two years due to a strangles outbreak. British Eventing has released data showing that the chance of suffering a serious or fatal injury while eventing in Britain has gone down for the fifth consecutive year. The Health and Safety Executive (HSE) has launched a section of its website dedicated entirely aimed at providing support and advice to individuals and businesses in Wales on maintaining high standards of health and safety in workplaces. Launching the site, HSE Director for Wales Terry Rose said: "We already work closely with the Welsh Assembly Government, as well as local authorities and a range of other partners in promoting good health and safety in the workplace in Wales. "There are clearly many areas of common interest including agriculture, healthcare and education, and with a different government situation in Wales, it makes sense to adopt a different approach to providing public information online too." "This site will allow us to better target online advice and guidance on those parts of HSE's national strategy that are of particular importance to Wales. "HSE already provides Welsh language facilities through its public information call centre, HSE Infoline. The new site is in response to public demand and will allow us to improve our Welsh language provision, and we are working closely with the Welsh Language Board to ensure this is achieved." The HSE Wales website gives details of news items, events and advice on protecting against risks to health and safety arising from work activities. It will be developed further in the coming months. The HSE is urging farmers and the animal feed industry to reassess risks associated with feed storage following the death of a young Northamptonshire farmer. The farmer was killed when a tipping trailer, used for storing animal feed, overbalanced and crushed him. The sleepers that were used to support the trailer were rotten and collapsed under the weight of the feed. Recording a verdict of accidental death, the Northamptonshire Coroner said: "Farmers should look objectively at the practices that they have adopted over many years. Just because they have been doing something in a certain way for a long time does not mean it is safe. In other words they should carry out a risk assessment." HSE Principal Inspector Samantha Peace said: "It is essential that farmers take on board this advice and take action where necessary. It is important to recognise the dangers of makeshift equipment. "Purpose made storage bins should be used for storage of animal feed but if trailers have to be used then they should remain attached to a tractor if the trailer body is raised." · The trailer should not rely on the hydraulics for continuous support. Suitable props or ram scotches must be used. · The wheels need to be chocked as trailer parking brakes are often unreliable and on a twin axle trailer may only brake one axle which will be ineffective if weight transfers to the rear. · Stability - the means to prevent the trailer tipping over backwards should be equally effective as being hitched to a tractor - e.g. by securing the draw-bar to the ground or providing a counter balance, at the hitching point, equivalent to the weight of the tractor normally used on that trailer. · Whatever the method of storage, it should be inspected regularly for signs of deterioration which could affect the structural integrity. Any defects must be rectified immediately. HSE have asked the feed industry to bring this incident to the attention of farms where they deliver into similar facilities. Using trailers as feed bins creates a real safety risk that needs to be sensibly managed to prevent harm to farmers, their families and their businesses. Health and safety law is often used as an excuse to stop children taking part in exciting activities, but well-managed risk is good for them. It engages their imagination, helps them learn and even teaches them to manage risks for themselves in the future. They won’t understand about risk if they’re wrapped in cotton wool. Risk itself won’t damage children, but ill-managed and overprotective actions could! In a bid to improve off-road accessibility and safety for horse riders, an online petition to the Prime Minister is calling for funding and legislation to create new public bridleways. The petition has been launched by Sue Jeggo, former British Horse Society (BHS) Access Officer for Cambridge (1996 – 2006) and recipient of the BHS’s prestigious 2002 Sefton Award for outstanding work in the field of riding and road safety. The petition reads “We the undersigned petition the Prime Minister to provide funding and use legislation for creation of new public bridleways. Horse Riders have access to less than 25% of the current public rights of way network, and face danger when using today’s busy roads. To ensure appropriate funding is in place and legislation (Highway Act 1980 S26) to be used by local authorities for new bridleways to be shown on definitive maps and ordnance survey maps. To ensure the Highway Agency develops a national programme of re-instating severed crossing points by creating new dedicated bridle bridges or underpasses as safe crossing points for motorways or trunk roads. 42 horses were killed in a barn blaze - foul play is not suspected. An electric space heater fell and started the barn fire that killed 15 horses in a boarding stable in rural Pierce County, fire officials say. Six foals and two adult horses have died following a 'suspicious' fire at an outbuilding in Green Lane, Chertsey. Seven animals were killed in the blaze, which broke out just after 6pm, and one had to be put down at the scene by an RSPCA vet after receiving serious injuries. It is not yet known how the fire started, and police are treating the blaze as suspicious. Nine of the 11 horses kept at the Special Pals Riding Stable died after being trapped in a fire investigators have ruled was arson. A fire at a Windham farm killed eight horses trapped in a barn. The barn fire broke out at about 4:30 a.m. A young woman who lived at the farm burned her hand when she tried to open the stable door to rescue the horses, but was unable to get in because of the heat and flames, said Windham Fire Chief Charles Hammond. She told fire officials that it appeared the horses were unconscious. The Fire Chief added that the damage is so extensive that it may never be known how the barn fire started. Fast action by staff at Greatwood, a charity that cares for ex-racehorses, averted disaster when a fire broke out. It is thought that the fire was started by a faulty lightbulb, which exploded with sparks setting fire to the bedding. Northants Fire and Rescue were called to put out a manure heap blaze. Around 180 tonnes of hay were destroyed and farming machinery damaged after an open-sided barn caught fire after a spark from a jump lead to start a car hit a nearby hay bale on New Year’s Eve. A grass fire on 49 acres (20 hectares) of a mountain in Carmarthenshire was started deliberately, say fire chiefs. Crews were called to the Black Mountain near Ammanford on Monday evening, but the fire was allowed to burn because it was too dangerous for firefighters. But Mid and West Wales Fire Service was called out again on Tuesday morning over concerns 15 horses located nearby are being put under threat. A fire which tore through part of a farm shop near York saw the daring rescue of a trapped reindeer by the store’s owner. The Christmas grotto at the farm shop was gutted in the blaze, which emergency services believe was the result of an electrical fault. A life sized mannequin horse and other specialised equipment has been brought in at a cost of £14,000 to help firefighters train in animal rescue. The fake horse, which is 15 hands high, has been funded by the Wiltshire branches of the RSPCA to allow Wiltshire Fire and Rescue Service to practise the specialist techniques used to save animals that have got into trouble. A horse had to be rescued by 12 firemen after it became stuck in a stream at Sutton-in-Ashfield. It is expected to make a full recovery. A pony that was found tangled in a wire fence in Keyhaven Marshes in the New Forest is expected to make a full recovery. A horse had to be rescued by firefighters from a ditch in Stratton Audley on Saturday. The horse was said to be making a full recovery. Police would like to speak to anyone who has suffered a faulty trailer incident after a horse was killed when the ramp of the trailer in which she was travelling fell down. I know that this is quite unconventional, but I am the police officer heading this investigation. We really need to ensure that this does not happen again to anyone else. I also have horses and fully understand the feelings and concerns that arise when incidents like this happen. I am urgently trying to find other people that have experienced issues with the rear ramp of trailers falling, especially when a collision has occured as a result. For obvious reasons, I cannot disclose the make of this trailer until we are further in our investigation. I have already spoken with some people that have posted here but really need to see if we have others out there. An inquest has heard how 43-year-old Loretta Jane Topliss of Swadlincote, Derbyshire, died on Saturday 15 November as a result of falling from her horse after it was spooked while she was riding on the road. Experienced rider Margie Smith has circulated an email detailing the accident which killed her friend, Patty O’Neal, on 1 November in New York’s Mendon Ponds Park. On the trip to the park one of the horses in the trailers became distressed, spooking some of the others. To try to settle hers down, Ms O’Neal mounted him, hoping to ‘ride off’ his fears. She wasn’t wearing a riding hat. At the same time the original distressed horse, now being ridden, bucked and took off, unseating his rider and causing the saddle to slip and hang beneath him. In the fracas, Ms O’Neal’s head was smashed against a low branch, causing her to fall to the ground resulting in extensive injuries from which she couldn’t possibly recover. TV2 Denmark reports that a 14-year-old girl died on Sunday 3 November after falling from a horse and landing on her head. The girl was out riding near her home in Assens, on the Danish island of Fyn. She was still conscious when the ambulance took her to Odense University Hospital, but sadly doctors couldn't save her and she died of internal bleeding. According to police, she wasn't wearing a riding hat when the accident happened. A woman from north Shropshire was airlifted to hospital on Saturday (8 November) after she was injured loading a horse. It is believed she was loading a horse into a horsebox when the animal panicked and backed out of the horsebox, falling on her. The woman was airlifted to the Royal Shrewsbury Hospital but had not suffered serious injuries, and was discharged with bad bruising. A hunt follower was horrifically injured when he fell from his horse - and was impaled on the horn of his hunting whip. Tom Pitman, 38, was riding with the Beaufort Hunt when his horse Winston smashed through a gate and threw him off. He landed on the handle of his whip, which punched a two-and-a-half inch hole into his back below his shoulder blade. Hunt secretary Nigel Maidment dialled 999 and Tom was airlifted to Frenchay Hospital in Bristol, where he was kept in overnight and discharged the following day. A woman was airlifted to hospital with serious chest injuries on Wednesday after being kicked by a horse. The 38-year-old was clipping a horse at Hill Farm in Bressingham when it kicked her "square in the chest". She suffered broken ribs and a possible fractured sternum and was taken to the Norfolk and Norwich University Hospital because of its cardio-thorasics capabilities. One of the country's leading female jockeys is thankful to be alive tonight after she was pinned beneath a half-tonne horse in a freak accident. Trudy Thornton was riding at Ellerslie Racecourse when - seconds into the race - her horse suddenly collapsed and died before it even hit the ground. "Hugh Jackman dodged death during a horse-riding stunt on the set of new movie Australia, thanks to the stuffy rules set by the film's safety officer. Jackman was left red-faced when the officer, on-set on the insistence of the film's insurers, forced him to wear a helmet and padding for a training exercise with a bucking horse. But the precaution saved him from a certain death, when the horse violently threw him on the ground." Riders who were involved in a horrific accident that killed a horse are calling on drivers to be wary on country roads. A horse has died following a collision with a car in Ullenwood, Gloucestershire. 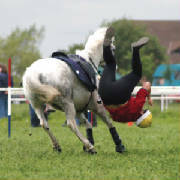 The owner of a Surrey riding school is delighted not to be liable for compensation after a rider was bucked off. Racehorse owners and trainers have renewed calls for changes in the law that says horse owners can be held strictly liable for injuries caused by their animals. An inquest jury has returned a verdict of accidental death in the case of a Nottinghamshire woman who was kicked in the head by a horse. Lucie Simpson, 20, from Carlton, died in May at the West Bridgford Equestrian Centre, after helping a vet with a mare and its foal. Nottingham Coroner's Court heard the vet had tried to resuscitate her but she died from bleeding on the brain. Lantra’s latest issue of Connect is the magazine for everyone with an interest in the environmental and land-based industries. Its inclusion of a special four-page feature all about Lantra’s summer Skills for Our Nation campaign makes it the biggest issue to date. Its 48 pages are packed full of information, news of events and inspiring case studies. 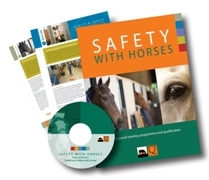 Equine and Farriery information can be found on pages 32 to 35. ‘Good yards Safe yards’ is a new mini-magazine from Equistudy with tips from top professionals designed to help everyone get the most out of their time spent with horses - safely. The Bulletin is a hidden gem for anyone interested in equestrian access issues. Produced by the Access Department of the British Horse Society it provides updates on equestrian access issues through a free monthly email newsletter. For more information and to see a sample of the newsletter visit the BHS Access off - road riding page. A farrier with 40 years' experience in the trade is writing a book to pass on his advice on keeping safe around horses to younger generations. The draft National Park Plan sets out the long-term vision and objectives for the National Park, together with the policies and actions for the next 5 years and beyond. It combines two important statutory documents in a single integrated plan. These are the National Park Management Plan and the Local Development Framework Core Strategy including Development Control policies. It is hoped that this will make the overall approach proposed for the National Park clearer for interested organisations and individuals. The formal consultation on the draft National Park Plan and draft Recreation Management Strategy closed on Friday 14 November. The Authority received around 9,000 responses to the draft Park Plan and the draft Recreation Management Strategy. The figure is made up of 900 completed response forms, letters or e-mails from individuals and organisations, of which initial analysis suggests that 65% have raised objections to the recreational horse-keeping policy; 900 standard letters or variations of the letter from NFDOG; and approximately 7,200 signatures on a petition by the Forest Uprising Group. Minimise the risk to your horse from fireworks. Fireworks set off next to the Te Atatu Pony Club spooked a horse named Kracker, causing it to bolt and badly wound itself. The horse was injured so severely that it had to be put down, leaving its 14-year-old owner devastated. A police horse and officer that were struck by a firecracker at the football derby on 25 October between Sunderland and Newcastle are not injured. BETA International, which celebrates its 30th anniversary in 2009, is the world’s foremost equestrian and country trade exhibition. Admission is strictly trade only. Researchers from BBC2’s Dragons’ Den show will be attending the trade exhibition seeking potential equestrian entrepreneurs with ingenious products and market-ready business plans. Dragons’ Den has previously attended BETA International. But for the first time this year, the production team plans to conduct on-camera auditions with filming taking place during the exhibition. Pictured above is the sand sculpture completed by Andrew Baynes; the result of three days performance art that took centre stage at last year's show. Lantra is pleased to host a number of free events in support of Apprenticeship Week in England (23 - 27 February 2009) to raise awareness of apprenticeships in the environmental and land-based industries and highlight how they can benefit your business. These inspiring and interactive events will include a range of informative presentations from apprentices, training providers and employers currently engaged in a range of exciting apprenticeship programmes. National Director for England, Madge Moore, said: "Apprenticeships have a central role to play helping firms maintain and improve business productivity during the economic downturn and these events will give businesses the opportunity to find out how." Friday 27 February, 10.30am - 2.00pm, Duchy College, Cornwall. email events@lantra.co.uk or call 0845 707 8007. Deadline for registrations is Wednesday 18th February 2009. On Monday 2nd March at Westbury-sub-Mendip Village Hall, and on Tuesday 3rd March at Bleadon Youth Club Hall 7.00 to 9.15 pm, meetings will be held to highlight the importance of good practice in equestrian activities. The meetings will have presentations from an expert in equestrian matters and landscape protection who has been pioneering regional guidance in SE England, and the Somerset Farming & Wildlife Advisory Group who advise on pasture management. 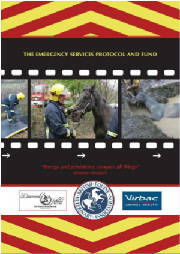 It is also hoped that Avon & Somerset Police will be attending to promote the ‘Horsewatch’ scheme. There will be opportunity to ask questions and discuss relevant issues. The meetings are aimed at equestrian businesses, landowners and people keeping horses in the AONB, as well as local elected councillors who comment on proposals for equestrian development. Business woman and TV personality Deborah Meaden has become the latest celebrity to show her support for Hoof — a London-based campaign to encourage city-dwellers to take up horse riding. Ü 22/01/09 Diary dates section updated. Ü 15/01/09 For Everyone section updated. Ü 09/01/09 Fire section updated. Ü 08/01/09 Finally... section updated. Ü 24/12/08 Disease section and scrolling News Headlines updated. Ü 21/12/08 Disease and Rescue sections updated. Ü 13/12/08 Horse Attacks and Other sections updated. Ü 08/12/08 Welfare section updated. Ü 06/12/08 For Everyone section added. Ü 01/12/08 Other News, Legal, Rescue, Welfare and Accident Sections updated. Ü 27/11/08 Rescue, Fire, HSE and Accident Sections updated. Ü 25/11/08 People Welfare and Rescue Sections updated. Ü 24/11/08 Transport Section updated.